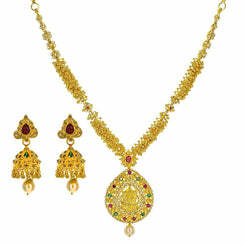 22K Yellow Gold Necklace and Earrings Set W/ Multi Color CZ Encrusted Cascade Bib Frame for women. This intricate multi color CZ encrusted bib necklace features an ornate peacock as well as a pear shaped, open design pendant. 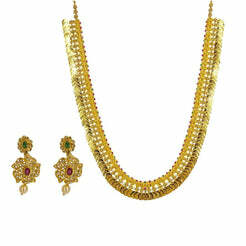 The necklace is 15" long with an adjustable width of 14-79 mm. Its pendant is 20 mm long and 15 mm wide. Each earring is 18 mm long and 13 mm wide. 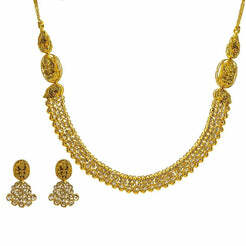 This exquisite set weighs 73 grams.